When I mentioned this recipe on Facebook, I wrote it as "carnitas," with the quote marks. That was because it is not made in a traditional way of braising then frying the meat, instead it cooks all day in the slow cooker. But now that I have had it as leftovers (and it was even better than the delicious first meal), I dropped the quote marks. I know purists may argue with me, but this recipe is worthy of no quote-mark innuendo. And it is so easy. Seriously. Just about the easiest thing I have made in the slow cooker. Even easier than the oh-so-simple braised short ribs. And I was skeptical of the results since I like my carnitas to have a bit of crispness to the edges. But I think that using such a small amount of liquid is the key. The juice/broth barely covered the meat when I started it. By the time I got home, most of it had cooked off. Not all of it. It was not dry. But enough had cooked off so that the top edges were above the liquid and and developed a sort of dry (in a good way) edge. Trim pork of excess fat (it's OK to leave some, it will help keep the pork moist and flavorful. I just don't like big pieces of fat). Cut into 3-4 inch pieces and place in the bottom of the slow cooker. Sprinkle with salt and cumin, then toss to coat. Add orange and lime juices and the smashed garlic cloves to the pork. Cook on the lowest setting for 8-10 hours (I set mine for 10 hours since I was going to be gone for work. )When the meat is cooked, remove it from the pot with the garlic, leaving any excess juice. Roughly chop the meat and garlic. Since I wanted to have a more complete meal, I made some sauteed yellow squash with shallot and garlic and then mixed in a can of (drained) black beans. 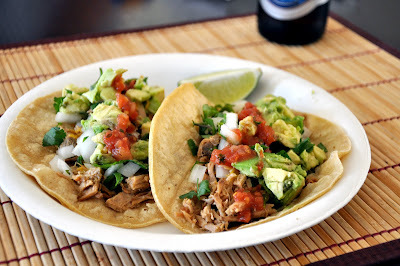 Today for lunch we had the leftover meat, once again in tacos. The citrus flavors were even more present than the prior night. I reheated the meat in a skillet on the stove to crisp it up a bit. When I think about making this, I think I spent more time getting the garnishes ready than I did prepping the meat and then chopping it at the end. We loved it, the kid loved it and it was easy. This will definitely become part of the regular rotation.